Terrence Farley was a prominent builder in the 1880s, highly involved in the flurry of construction on the Upper West Side. His three sons, Joseph, John and James followed in his footsteps; but while John and James carried on as T. Farley's Sons, Joseph struck out on his own. Joseph started his business in 1895. He focused on high-end speculative residences, sparing no expense on the opulence he knew his customers would demand. In 1900 he began work on two abutting homes at Nos. 3 and 5 East 82nd Street. Although the pair shared the same building permit; the architects, Janes & Leo, treated the design of each separately. The lavish five-story Beaux Arts style homes were completed a year later. The newly-completed No. 3 was sold to millionaire Solomon Loeb, a founder of the banking firm Kuhn, Loeb & Co. for $160,000--about $4.7 million today. On May 18, 1901 The New York Times reported on rumors that he had bought the house as a gift "for one of his daughters, who as recently married." When asked, Loeb replied that "he had not yet decided what he would do with the property." But before long he made up his mind. He transferred title to his daughter, Nina, and her husband Paul Warburg. The couple were in no way "recently married," having wed in 1895. When the Warburgs, with their five-year old son James and infant daughter Bettina, moved in, Paul was still dividing his time between Hamburg and New York. A member of his own family's German banking firm M. M. Warburg & Co.; he was now also a member of Kuhn, Loeb & Co. It was not until 1902 that Warburg made his permanent home New York and he would not become a U.S. citizen until 1911. Manhattan society was, for the most part, made up of Episcopalians with some ultra-wealthy Roman Catholics tolerated (although not in the ballroom of Caroline Schermerhorn Astor). Despite the staggering wealth of some Jewish families, they were generally excluded from social events and exclusive clubs. No. 3 East 82nd Street, therefore, was rarely the scene of grand entertainments; and then the guest list was for the most part limited to the wealthy Jewish community. When the Betty Loeb Musical Foundation of New-York City, for instance, was incorporated on January 15, 1903 "to promote musical interests and the advancement of musical education in New-York," the directors were all from the Loeb family: Theresa Schiff, Morris Loeb, Grita Seligman, James Loeb, and Nina Warburg. For some reason, Solomon Loeb's lavish gift seems to have fallen short. Following his death in December 1903, Warburg purchased the two old homes at Nos. 15 and 17 East 80th Street and commissioned mansion architect C. P. H. Gilbert to design a magnificent 45-foot wide replacement. In the fall of 1906 the Warburgs closed the 82nd Street house and left for Germany. They would not return until their new mansion was completed. 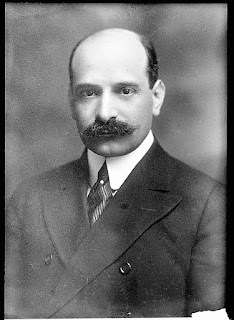 Paul Warburg in 1908, just months after leaving the 82nd Street mansion. from the collection of the Library of Congress. During the family's absence, the chauffeur checked on the Warburg automobiles in July 1907. They were kept at a garage at No. 36 West 43rd Street. To his surprise and panic, one was missing. Police were notified and a search begun. Then, a week later, a mechanic, John Chandler, unexpectedly drove the car into the garage. He was as surprised as the garage owners and the police. He explained that before Warburg left for Europe he instructed Chandler "to repair and test the car." Why the chauffeur was unaware of the instructions, and why Chandler had not informed the garage operators that he was taking the car made the excuse suspicious. Nevertheless, The New York Times reported "The matter will be laid aside until Mr. Warburg returns from abroad." 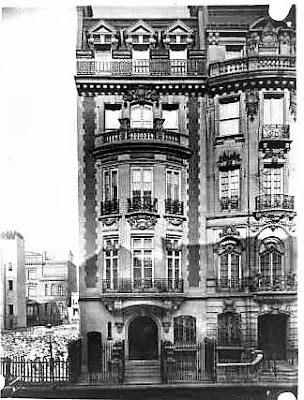 When the Warburgs returned in the summer of 1908 they moved into the new 80th Street mansion. On September 23 the New-York Tribune reported that Warburg had sold the 82nd Street house to Robert Hager, Jr. The 24-year old Hager had been educated at the prestigious Phillips Academy Andover and Yale University. He had left Yale in April 1906 to marry Dorothy Quincy Trowbridge. A baby daughter soon followed. Hager's incomplete college education made little difference to the family's lifestyle. He was born into wealth, his father being a retired banker. 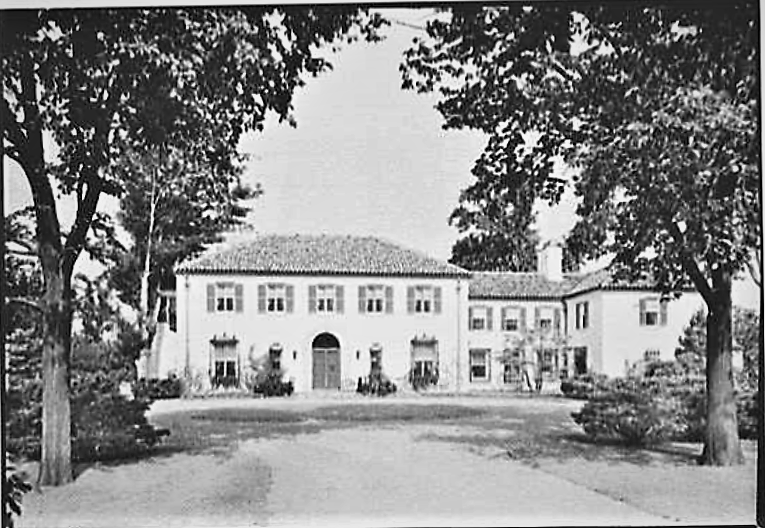 At the time of his purchase of the Warburg residence the family was living in a vintage mansion along the former Millionaires Row at No. 537 Fifth Avenue. He paid Warburg $130,000 for the 82nd Street house--around $3.5 million today. Like the Warburgs, the Hagers did not remain in the 25-foot wide mansion long. Hager sold it for $150,000 in January 1913 to David M. Gardiner. Gardiner came from one of the oldest and wealthiest New York families. It traced its American origins to Sir Lionel Gardiner, who purchased the 3,300-acre Gardiner's Island from the Native American Mohawk tribe in 1639 for, reportedly, "a barrel of rum, blankets, a gun and a large black dog." King Charles I made it official by granting him the island. Gardiner's Island was "an independent manor ruled only by the owner" until shortly after the Revolution, when it became part of the United States. Gardiner was 41 years old and a bachelor when he purchased No. 3. Moving in with him was his unmarried sister, Sarah Diodati Gardener. They had one brother, Robert, who was married. The brother and sister lived quietly, spending their summers in their country estates in West Islip and East Hampton, Long Island. Their names rarely appeared in the newspapers until a rather ugly legal battle was initiated by their sister-in-law, Nora Gardiner, in 1921. On December 8, 1919 the Gardiner's uncle, Charles G. Thompson died, leaving an estate of over $7 million. Robert Gardiner had died only months earlier and so was left out of the will. Sarah and David each received $150,000 each; a comfortable $2 million today. Feeling that Robert's two children should have benefited from the inheritance, they offered to give Alexandra and Robert $100,000. But when Nora challenged the the Thompson will in 1920, and the estate of her mother-in-law (who had died in 1916) the following year, Sarah and David were incensed. They asked the Surrogates' Court to annul the assignment of the $100,000, saying it was "executed by mistake." Nora fought back, initiating yet another court case against the brother and sister. It ended on September 1, 1921 when the courts directed David and Sarah to "make good their gift of $100,000." A few months later, in February, David once again was in court, this time as the plaintiff. He had been duped by con artist Samuel T. Greenfield in a phony stock scam. Greenfield knew that Gardiner owned $70,000 of a certain oil stock. He told Gardiner that he had an interested buyer. It was revealed in court on February 14, 1922 that "Greenfield persuaded him to swap his $70,000 worth of good stock for shares of other stocks which are, according to Assistant District Attorney Unger, who has looked them up, practically worthless." Although Greenfield was indicted, Gardiner was out a massive amount of money. In the meantime, Sarah busied herself with charitable works, among her favorites the Seamen's Church Institute. She regularly hosted sewing classes and teas in the mansion for its benefit. Much of David's philanthropic focus was on Long Island, and on Friday night, November 19, 1927 he was at the center of the dedication ceremonies of the newly-completed parish hall of St. Peter's Episcopal Church in Bay Shore. Just as he moved to hand the keys to the Rev. William R. Watson, he fell to the floor of the platform. Within minutes he was dead from a heart attack. 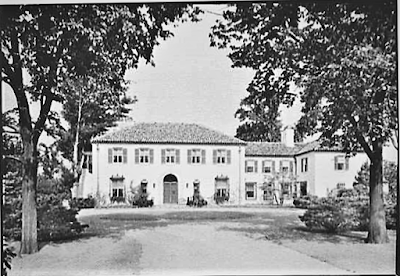 Sarah, who was 64 years old at the time, continued to live on in 82nd Street mansion and the Long Island summer estates. She added dramatically to her real estate holdings in 1937 when she rescued Gardiner's Island from foreclosure. Lion Gardiner, "thirteenth proprietor of the island," according to The Times, had died on February 27, 1936. The will of his childless uncle Jonathan T. Gardiner, who had died only three years earlier, directed that the island "should be sold to a person bearing the surname of Gardiner." Lion took a mortgage of $345,000 to buy the property. Now the Bank of New York and Trust Company foreclosed on his widow, Ida L. Gardiner and an auction sale was scheduled for June 10. Sarah stepped in, saving the 300-year Gardiner family ownership. Interestingly she never stayed on the property, telling friends it was "too isolated." Instead she leased the island and the manor house with its colonial antiques to wealthy families like Clarance Mackey (until 1938) and polo player and sportsman Winston Guest and his wife. As Sarah grew older and more feeble, she took a companion to live with her in the 82nd Street house--one with another old New York family name. Florence Van Rensselaer counted among her ancestors not only the old Dutch Van Renselaer family, but the Schuylers and Livingstons. She would go on to publish The Van Rensselaers in Holland and In America in 1956. Sarah died in No. 3 East 82nd Street on January 5, 1953 at the age of 90. Florence Van Rensselaer received $150,000 and a life estate in a $200,000 trust. Alexandra Diodati Gardiner Creel, her niece named in the 1921 lawsuit, inherited the house and $100,000. She and her brother, Robert, became the new owners of Gardiner's Island. Alexandra almost immediately sold No. 3 and it was converted to three apartments per floor in 1954. In 1980 it was purchased by the Wenjil Realty Company. As the tenants gradually moved out, their apartments were not re-rented. From about 1994 until the fall of 1997 the grand brick and stone mansion sat unoccupied while the owner, Dr. Carlo Civelli, worked on renovations in disorganized stages. He gutted the interiors and filed plans to alter the house into a mix of apartments. At some point Civelli abandoned his project and in 2006 a new renovation returned the mansion to a single family home. Despite its sad treatment in the last decade of the 20th century, the exterior appears little difference than when Paul and Nina Warburg moved in in 1901. Thanks for this. Walked by it numerous times. During the mid to late 1960s I live with my parents at 24-26 East 82nd Street, a one-time mansion converted to apartments. I was told by people working in the bookstore around the corner there about the building's fascinating history as a mansion. Don't suppose you've ever written about that building?